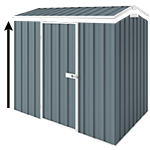 Our Cheap Sheds Team is right here waiting to chat to you. They are friendly and knowledgeable, so if you have a question about any of our products, assembly or just storage in general they can help you out. Maybe you are not even sure what you are after or where to even begin, which is okay! Get in touch anyways and we can help set you on the right path. Try our Customer Chat Box at the bottom left hand side of your screen. It’s probably the quickest method to reach us if it’s during service time. Just type us a message and someone will be with you shortly to help out. If you prefer to hop on the phone and speak to us directly, just simply call our customer service line on 1300 920 219 or 07 3053 5768 and you can chat to one of our team members (not a machine).